Last week we learned how diversification can be used to limit downside exposure during market corrections. Another thing that can help investors during such periods of heightened volatility is the ability to refrain from panicking. Indeed, it generally is not a good idea to make decisions based solely on emotion and this is especially true for investing. Violent selloffs can be quite scary, but the historic performance of the stock market has repeatedly shown that large drawdowns are often not the best time to sell. The S&P 500, for instance, plunged by more than 50 percent during the financial crisis but even after 2018’s yearend turmoil, the benchmark index is still up over 60 percent from the pre-recession peak, and nearly 300 percent from the 2009 low. Behavioral economists recommend simply paying less attention to the day-to-day fluctuations in the market because the odds of seeing an adverse move in the value of a well-diversified stock portfolio should decline as the period between each valuation check expands. Of course, for many retail investors it is not easy to ignore volatility and keep emotions out of the decision process. This might have been the case for anyone who turned on the television last month and saw the Dow Jones Industrial Average during a 7-day stretch tumble by at least 350 points on six occasions. Updated data from Alight Solutions even showed that during 9 of the 19 trading days in December there was above-normal trading activity among 401(k) participants, with the bulk of funds flowing from equities into fixed income. There are several reasons why plunging stock prices might cause an investor to act hastily. 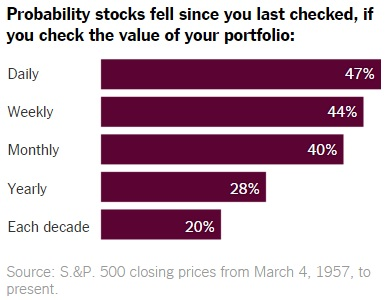 For example, people near the age of retirement will likely become very nervous during a market meltdown as they watch their nest-egg rapidly lose value. Many older Americans during the financial crisis probably believed that they were doing the right thing by selling as stocks crashed, but the subsequent multi-year bull market suggests that their equity investments would have likely more than fully recovered if they were able to weather through it all. For such individuals, though, their problem has less to do with panic selling and more to do with having an elevated exposure to the stock market at this stage in their life. Indeed, the closer one gets to retirement, the smaller their equity holdings should be. If the bulk of your investments are in more conservative assets, e.g. bonds and cash-like instruments, then it should be a lot easier for you to avoid making emotional based decisions since the portion of your portfolio that is still invested in the stock market is relatively small. Another issue that can bring about panic trading is the practice of buying high and selling low. Specifically, it is said that investors should aim to “buy low and sell high,” but the opposite is what too frequently occurs. For example, many retail investors tend to be “late to the party” relative to institutional traders in that they buy close to market tops and sell near the bottom. This exacerbates the negative effects of a drawdown for such investors and therefore increases the likelihood that they will be scared out of a position or forced out by a margin call. Moreover, investors can sometimes benefit from stepping in and actually buying during times of market panic and picking up shares of quality companies at a discount, rather than waiting until they see headline after headline about the market hitting a new record high to step in. Trying to time the market, though, is both difficult and risky. As a result, the best thing to do may be to start investing as early on in one’s life as possible so that more time is available for the market (and your retirement portfolio) to recover from temporary shocks. Additional assistance is available by regularly consulting with a professional financial advisor and as always, we are here to help with any questions you may have.